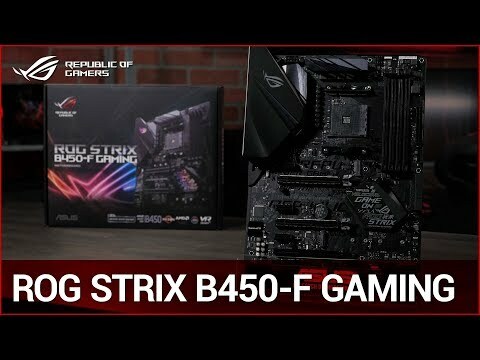 ROG STRIX ATX MOTHERBOARD with AURA SYNCROG Strix B450 Gaming series provide a widespread of features that give users all the essentials for a well-balanced build. The ROG Strix B450-F Gaming motherboard features firmware controls and software utilities crafted for all skill levels, making first-time setup, tuning, and system maintenance simple. With options from overclocking and cooling to managing network performance and audio characteristics, you can configure your ROG Strix gaming build to perform the way you want. The ROG STRIX B450-F Gaming has everything you need to build on a budget or load up with high-performance components to game in the big leagues. The B450 offers rich customisation options with Aura sync along with performance tuning and optimisation using the intuitive easy to use ROG software. Comprehensive Cooling Controls ROG Strix B450-F Gaming features the most comprehensive cooling options ever, configurable via Fan Xpert 4 or the UEFI BIOS. Each header can be set to monitor and react to the thermal sensors. Via Fan Xpert 4, you can also assign a sensor to monitor the temperature of supported ASUS graphics cards to ensure optimal cooling during GPU- or CPU-intensive workload Each onboard CHA FAN header supports PWM and DC mode. Ultrafast M.2 Connectivity with RAID support Dual PCIe 3.0 x4 M.2 slots provide NVMe SSD RAID support for an incredible performance boost. Create a RAID configuration with up to three PCIe 3.0 storage devices via two M.2 slots and a PCIe x16 slot to enjoy incredible data-transfer speeds. THE MOST IMMERSIVE ENTERTAINMENT The ASUS Beyond VR Ready marque means that ROG Strix B450-F Gaming has been tested with loads of class-leading components to ensure that your productivity, gaming and entertainment needs are tuned for maximum performance. ASUS Beyond VR Ready provides a new way to configure and build your dream system with total confidence. PREMIUM ASUS LANGUARD TECHNOLOGY ROG Strix B450-F Gaming features Intel Ethernet (I211-AT), ensuring data exchanges with your network and the outside world are fast and smooth. Intel LAN reduces CPU overhead and increases TCP and UDP throughput, keeping more processing power available for the game. Also featuring advanced signal-coupling technology and high-tolerance components, LANGuard provides consistent Ethernet performance and greater protection against static electricity and power surges. PATENT PENDING DESIGN ROG's patent-pending I/O shield is finished in sleek matte black and comes pre-mounted to make it easier then ever to install the motherboard. ASUS ROG STRIX B450-F GAMING, AMD B450, S AM4, DDR4, SATA3, Dual M.2, 3-Way CrossFire, Intel GbE, USB 3.1 Gen2 A,ATX is rated 5.0 out of 5 by 2. Rated 5 out of 5 by Byrol from Amazing Motherboard for gaming. Amazing motherboard for the price.Im Very happy with that.Quite amazed by the impact a motherboard can make in terms of performance. Rated 5 out of 5 by Joe14 from Excellent B450 board for the price It's always hard to decide how to rate something, but I'd say this board is 5-star for the price, 4-star for objective quality / features. If you look around at reviews and analyses, you'll see people mentioning the lacking VRM phases. This is only a problem if you intend on overclocking. Keeping at stock speeds with a Strix R9 390x, 16GB 3GHz Corsair Dominator memory and a 2600x, I'm not left wanting. Minimum 90fps on Divinity Original Sin 2, avg 140, is just dandy. Board temperatures are absolutely fine. Unfortunately there is no good software to contral fans as yet: The only desktop software is Asus's FanExpert as part of AI Suite 3, which is still a very bloated and temperamental solution. Setting fan curves manually in the BIOS works okay, though you can only set 2 points. Having done this though and set a high threshold for the higher fan speeds, my tower is 95% silent for web use etc: the lack of a more fine-grained fan curve means there is a bit of fan spin-up every now and then. Overall though a very good board, and good quick delivery from Scan. Nice selection of I/O, quality audio codec & SPDIF. Looks nice, too. Some pictures make it look very gaudy, it's actually quite slick. Should last me a few years. I'll update this in six months.